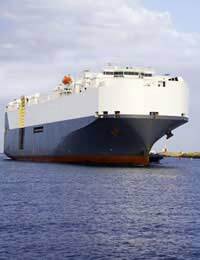 If you’re moving abroad and intend shipping your car overseas the two main things you’re going to need to consider are looking for an appropriate company to ship it and the things you need to do with regards to informing the DVLA. You must notify the DVLA if you intend taking your car out of the country. That applies even if you’re moving to France and driving your car through the tunnel. You need to complete section C of your V5 registration document to show the intended date of export and then a certificate of export (V561) will be issued to you in place of your V5 registration which will then enable you to register the vehicle abroad. To obtain a certificate of export, you should complete the relevant section of your V5 document and return it to the DVLA in Swansea or make the application at your local DVLA office but you need to do this a minimum of 14 days before your intended date of export. If you currently have a V5C registration certificate, you need to complete the relevant slip on the V5C which is called the V5C/4 (the notification of export) and send that to the DVLA. You’re then able to take the remainder of the V5C to the country you’re going to when the vehicle is being exported. If you are not in possession of either a V5C or V5 registration document, you can obtain one by completing the form V62 which you can get from the Post Office, and then send that to the DVLA. Then, follow the steps above. More information can be obtained from the DVLA website. It’s important that you shop around when looking for a company to ship your car overseas. Prices can vary widely and the cheapest price may not always be the best value for money. There are several things you’ll need to consider. Will they be shipping the car from door to door or from terminal to terminal?Some companies might be cheaper but they might only ship your car to the nearest port to where you live at the other end. This won’t be too bad if you don’t live too far from the terminal but if you’re several miles away, this could involve greater costs overall. And, if you’re moving to a remote location, the actual cost of delivering the car to your new home might very well end up costing more than the actual shipping itself so when obtaining quotes, make sure you obtain full quotes which meet your exact specifications and not just get a basic quote with just the ‘top line’ on it. What about shipping insurance? Most international shipping companies will offer some kind of basic insurance coverage but you need to find out what ‘basic’ includes and, more importantly, what it doesn’t include. Some may offer a higher premium depending on your destination and the type of car you have. And, if you’ve got an antique or ‘classic car’ or some kind of expensive sports model or luxury car, you’re better off taking out a higher insurance premium to cover the cost of your investment. To keep charges as low as possible, some international shipping companies will use different routes and different carriers to get you a lower price. Whilst that’s very noble of them, it’s no use to you if that means your car goes all the way around Europe one way then comes back upon itself and comes all the way around the other side before it finally reaches its destination. You’ll probably want your car as soon as possible after you get to your destination yourself, so you also need to check how long it will take before your car reaches its intended destination. Try to obtain bona fide references from people who have used the company before in order to ship their vehicle. You might not object to paying a little extra if you’ve been able to obtain references and have good faith that your car is in good hands. Also, all shipping companies will give you a shipping report which will highlight any minor damages, dents or scratches that are on the vehicle before it is shipped. Before you sign this make sure that you agree with the reports findings. It’ll be the only record of the state of your vehicle before it is shipped and you’ll want to ensure that your car matches the report when it reaches its destination before you can be sure that no further damage has been inflicted on it during the journey.